If you happen to be in Vietnam this autumn, Mu Cang Chai should certainly top your travel bucket list. During September and October every year, Mu Cang Chai welcomes thousands of travellers who come here to adore its gorgeous yellow rice terraced fields shining under the sunlight. 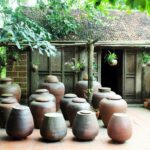 Where is Mu Cang Chai in Vietnam? Located 280 km from Hanoi, Mu Cang Chai is a district in Yen Bai Province in North Vietnam. This is where a large number of Hmong ethnic minority groups live. When is the best time to visit Mu Cang Chai? 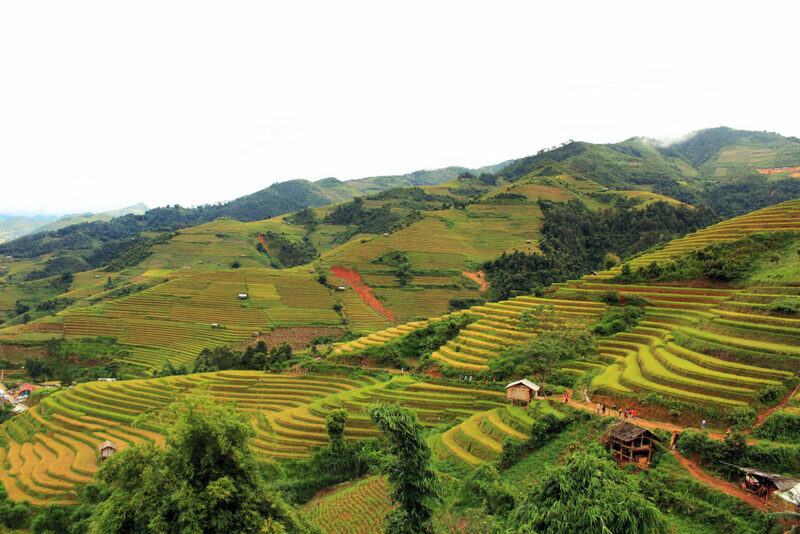 The best time to visit Mu Cang Chai is during the harvest season from the end of September to the beginning of October. During this time of the year, you will be able to see yellow terraced fields stacking on top of each other like this. 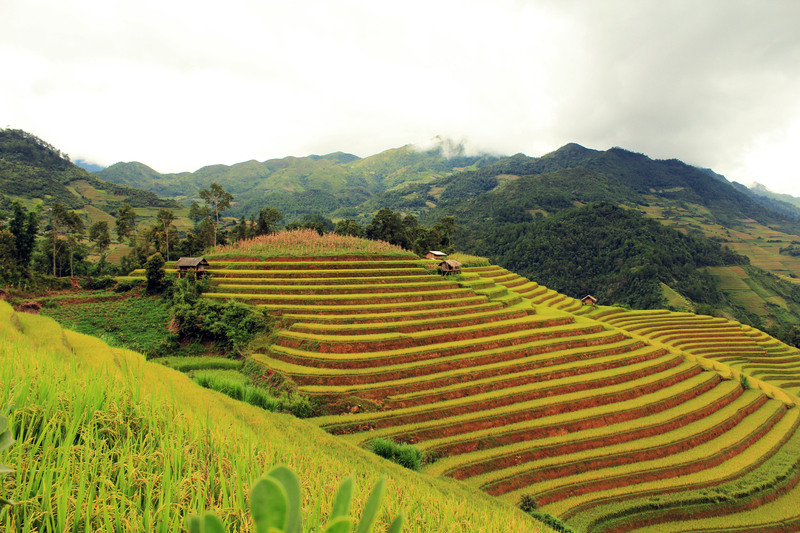 You can also visit Mu Cang Chai in August when the rice terraced fields in are still green. At the end of September, the annual Mu Cang Chai travel festival will take place with interesting activities such as traditional games, traditional food events and most fascinatingly, GLIDING! Yes, imagine doing gliding above these gorgeous terraced fields! That’ll be an awesome experience! Alternatively, you can travel to Mu Cang Chai in May – June, which is the irrigation period. 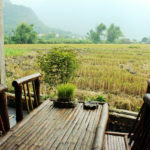 During this season, you will have the chance to observe the beautiful scene of water running down vast terraced fields. So where exactly can we see yellow terraced fields in Mu Cang Chai? 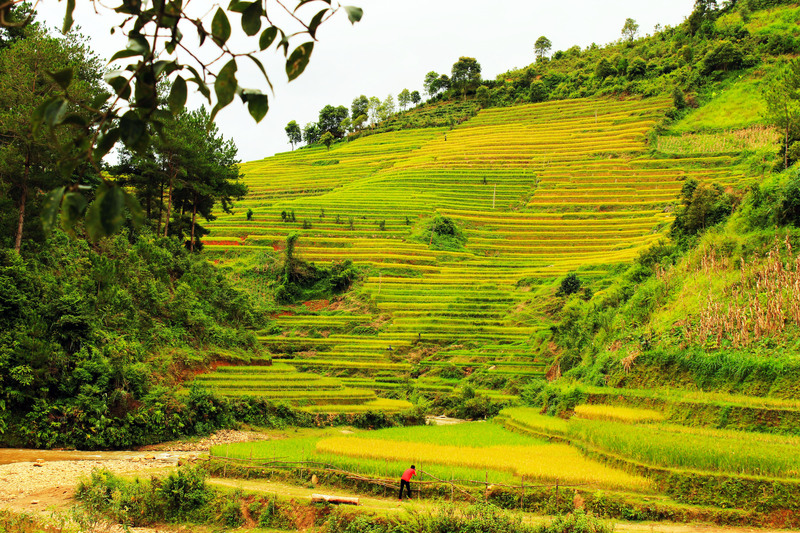 Places where you can see yellow terraced fields in Mu Cang Chai include Tu Le Valley, Lim Mong Village and the 3 wards La Pan Tan, Che Cu Nha and Ze Xu Phinh. 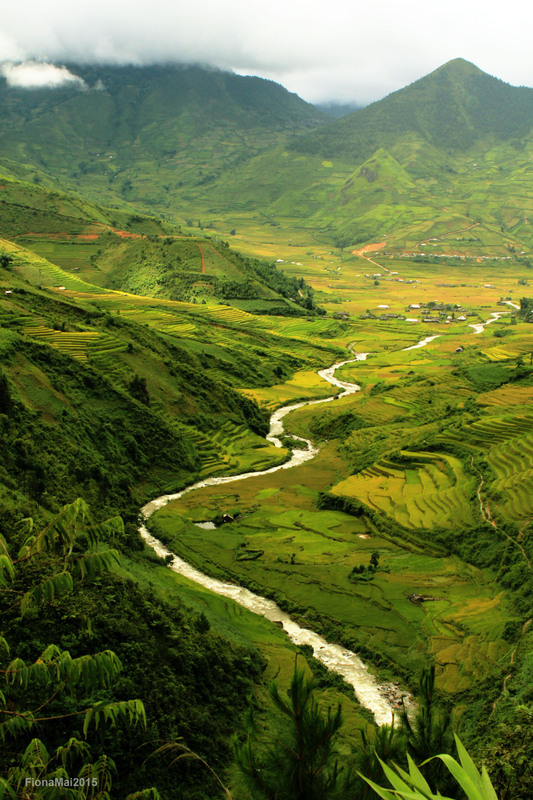 Mu Cang Chai’s scenery also features mesmerising valleys and rivers, despite not being as spectacular as Ha Giang’s. 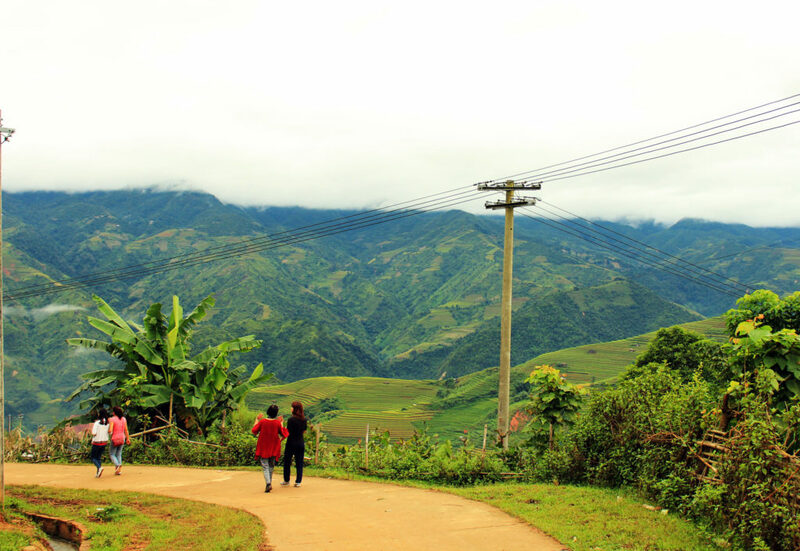 On the way to Mu Cang Chai, you will go pass Khau Pha Pass – one of the most challenging passes of North Vietnam. Sceneries along Khau Pha pass are truly stunning! 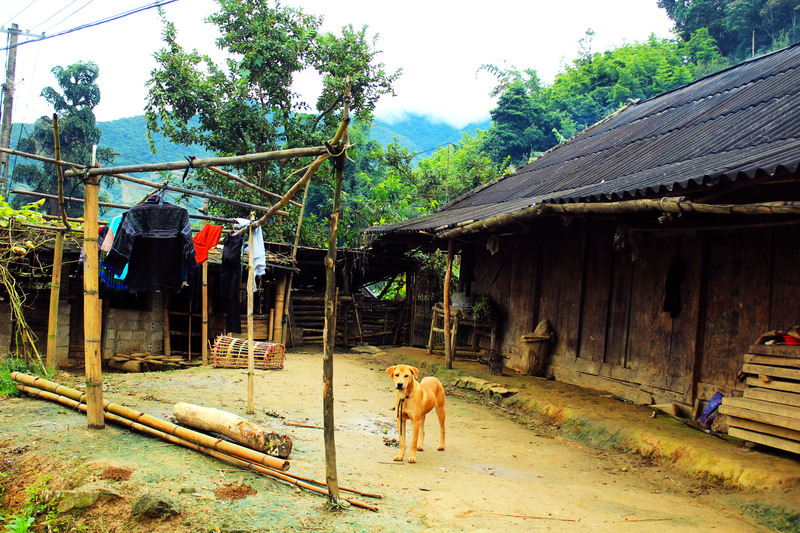 In addition, the local H’mong culture is a fascinating attraction of this area. If you expect the local H’mong here to speak English fluently and try to sell you whatever they have in their baskets just like in Sapa, you’re totally in the wrong place. The benign locals here might appear shy at first when being approached, but they will be willing to smile back at you in the most friendly way once you have exchanged the first few lines. 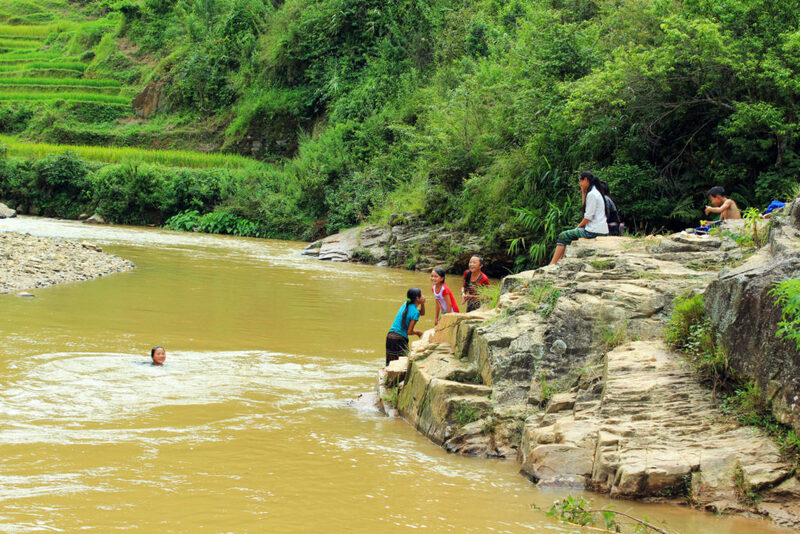 I bumped into the scene of local H’mong children playing boisterously by the river on my first day here. It was one of the most beautiful moments I captured during my trip. 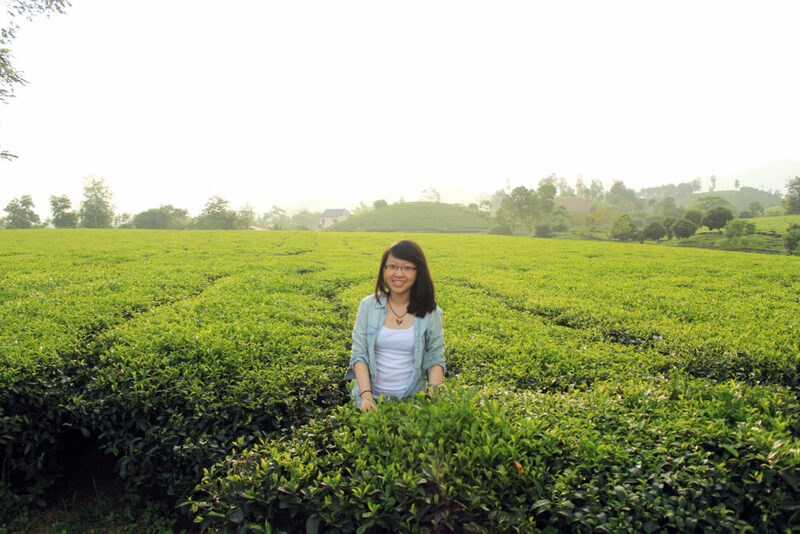 On the way to Mu Cang Chai, you might go pass Phu Tho Province where there are some beautiful tea farms. You can drop by and take some photos there. 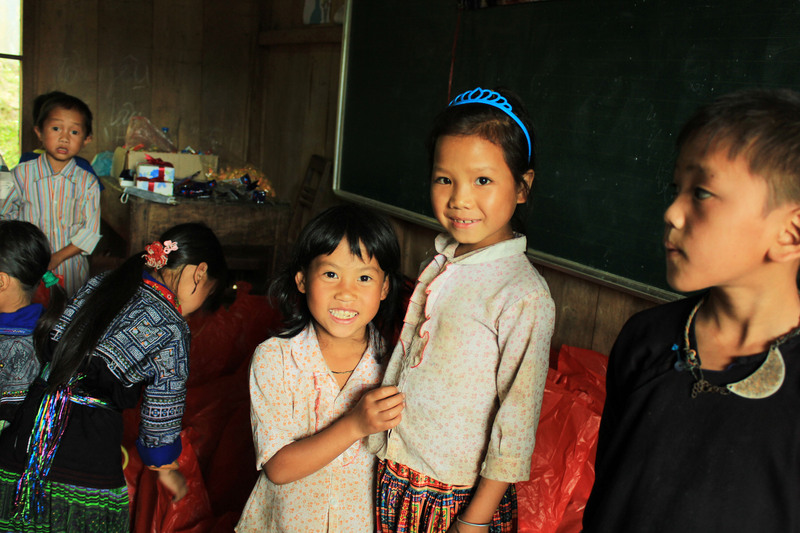 In October 2015, I had the opportunity to travel to Mu Cang Chai with Go to Know Club – a responsible travel club for young people in Vietnam – and Think Playground – an organization aiming to build playgrounds for children using recycled stuff. During the trip, we spent the night at Lao Chai Elementary School. The majority of students here belonged to the Hmong ethnic group. Our activities were building the playground for this school, designing the school walls and organizing educational games for the students. It was an awesome and rewarding experience that I would never forget. Here’s how it looked when we first arrived. The kids were already excited about the recycled tyres that we would use to build their playground. I also remember visiting an elementary school in Tokyo and meeting the children there; great memories! 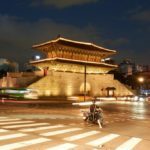 Come to think of it, most of my best memories come from having interacted with locals, such as when I acquired an unexpected Tour Guide in Busan! Thank you for your comment! I’m using a Canon EOS 600D with 2 lens: 18-55 mm and 50 mm, which are neither too expensive nor professional. I think the landscape and people themselves make the photos stunning, rather than my photography skill haha :D. Great to hear about your experience in Tokyo and Busan. I also believe that the local people play a critical part in shaping our travel experience at any place we go to 🙂 Please feel free to keep in touch! Amazing! This blog looks exactly like my old one! It’s on a entirely different subject but it has pretty much the same layout and design. Ousntanditg choice of colors! I first heard about these H’mong people from the Clint Eastwood movie, Gran Torino. 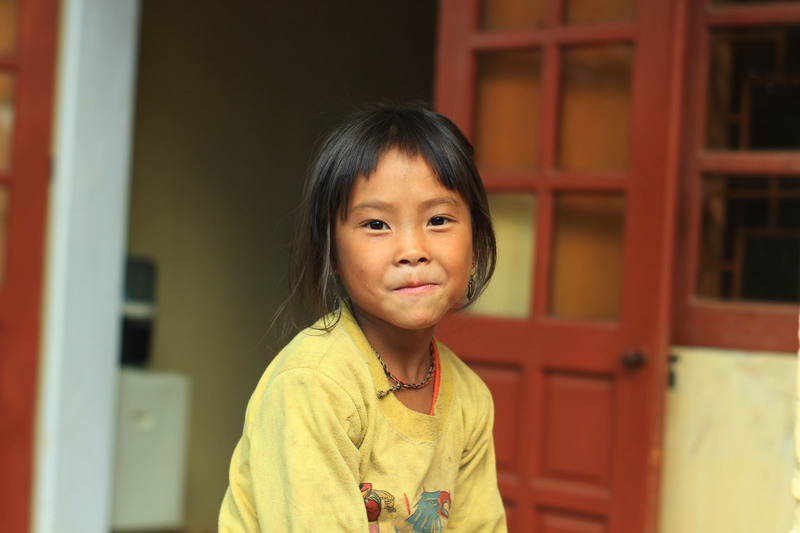 If you haven’t seen it you’ll enjoy it, moreso after visiting the H’mong tribe. You certainly picked the best time to visit, your pictures are very colorful. The Phu Tho tea farm looks very interesting, it actually translates to a rude word in Spanish. Again you have some great people photography! I’m visiting Vietnam in about a month and now wish I had planned to go in September or October so I could see those yellow rice fields! Ps, love your pictures of the kids!! They are so cute! I have never been to Asia and your photos look really appealing. You know there are some friends of mine that wish to travel to Vietnam! For sure I will share with them this post! Beautiful place to explore. This place reminds me of rice terraces in the Philippines- its a great place for photography when its almost harvest time. Your photos are breathtaking! I’d love to visit and try gliding over the fields. It really warms my heart to see children play in nature and not on an iPad – you don’t see that too often these days! Beautiful! I love that you stumbled on the kids playing in the river. It’s always special to get a glimpse into the local everyday life. I’ve only seen terraced rice paddies once, in Indonesia. There were at least 50 levels (steps) and it was an amazing site. 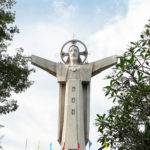 Anyone who has never seen something like this absolutely should seek it out, and Vietnam is a wonderful place. Oh what great information. 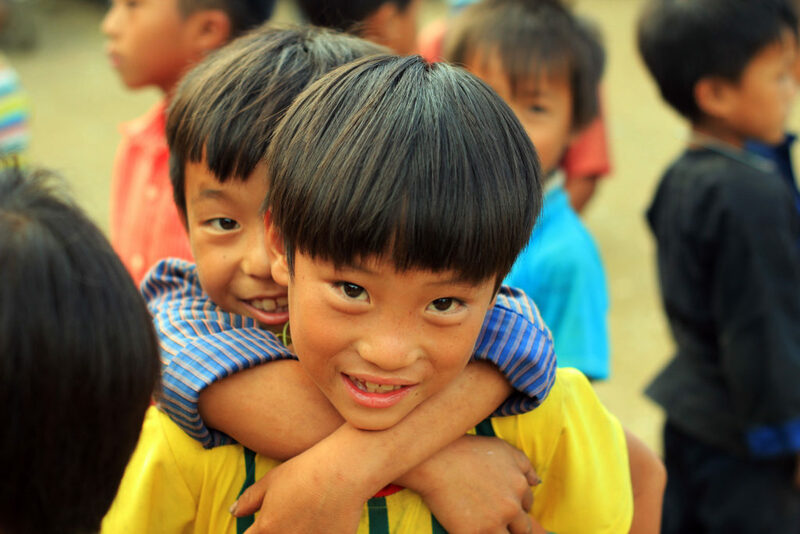 We have never been to Vietnam, we will have to keep your info for a future travel adventure. Your photos are beautiful ! I love that you helped out building the playground ! Thank you for sharing! Vietnam is so beautiful and I so wanna visit it. its lush green and loved that terrace farming picture. Impressive. I’m glad you included responsible travel groups to go with. It’s important to keep that in mind when traveling! It also looks very green here and like a great day trip! great to know the best times to see the rice fields. really like your shots of the local kids! 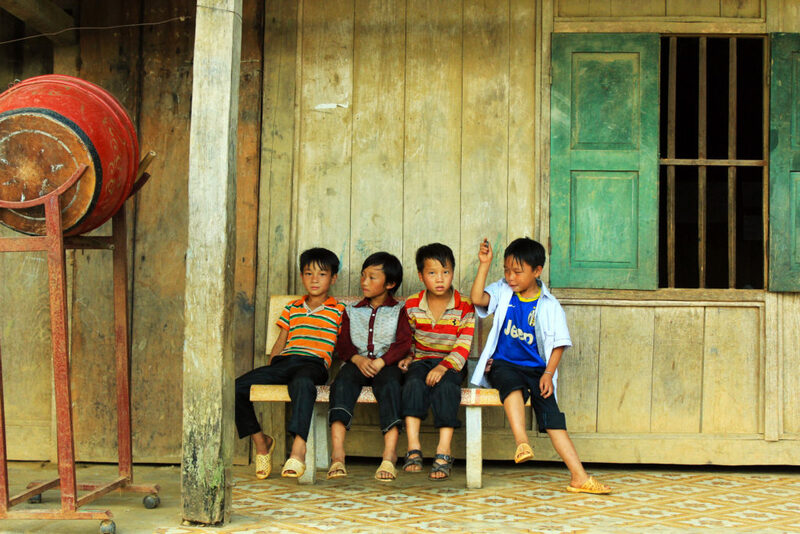 I’ve never heard of Mu Cang Chai but your pictures make me want to go. I would like to go in the harvest season and see the yellow rice terraces. It’s nice that you were able to help the school children too. I hope destiny takes me to this place. I loved the scenes, the kids their smiles and activities. The pictures really draw us to it. Stunning views! Such beautiful photos, I wish I could see it myself some day! 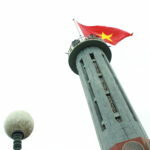 Vietnam is a beautiful country and the people are open and friendly! Would love to do the Khau Pha Pass hike, seems quite challenging! Beautiful pictures. I really liked the pictures with the children playing in the river. Such a natural and happy moment you captured there. This reminds me of my time in Longji rice terraces in China. Although it’s not high mountains, there’s something magical about being surrounded by rice terraces. This seems equivalent to my my own experience with the local/natives in the area adding to the experience. Wow this looking incredible! Putting it on my bucket list! What an amazing place. i love spending time in the nature so I would definitely take this place into consideration when I am in Vietnam. Oh. My. Gah. Those are some seriously beautiful terraced fields!! Never seen anything like it in my life – you have captured them wonderfully in your photos!! Oh wow Vietnam looks amazing. I am definitely going to pay it a visit. You are a very good photographer too which makes it even more inviting. I can imagine it to be so peaceful and calming. I must go! Thanks for sharing your experiences and trips with us all. Stunning and beautiful pictures and all so natural!! This really looks like a great place to visit and I will add into my bucket list. Thanks for the inspiration and keep up the awesome work. This is a beautiful post, and photos too! 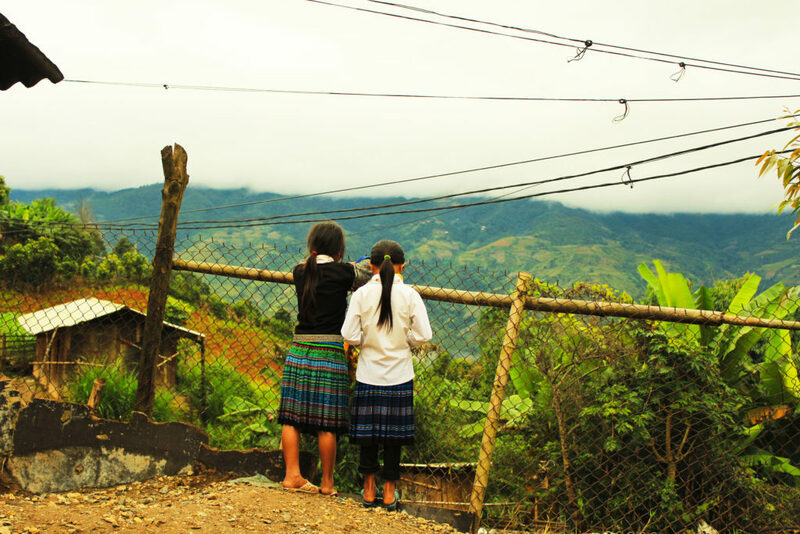 I’ve been to Vietnam, but never Mu Cang Chai. Those colours of the rice terraces are stunning, and the travel festival at the end of September sounds like one to look out for too! A great post.